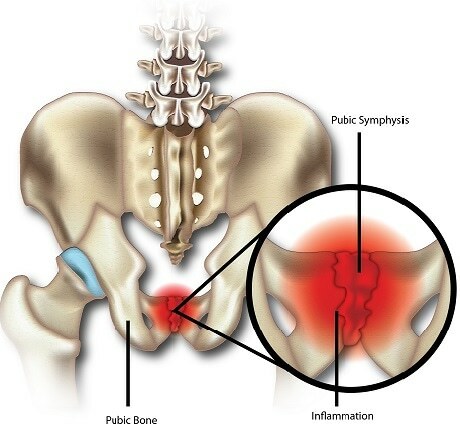 Osteitis pubis is a groin injury characterized by pelvic pain in the pubic symphysis joint and joint dysfunction. The pubic symphysis is a fibrocartilaginous joint that unites the two pubis bones of the pelvis, resists shearing and compression but is able to widen during pregnancy. While the mechanism by which this injury occurs is not completely established, it is likely to be due to inflammation caused by repetitive stress from the abdominal and adductor muscles that attach to the pelvis. This stress results in micro-damages to the joint and altered biomechanics (that is, how forces are applied to the region of the body). This condition is difficult to distinguish from groin (adductor) strains because symptoms are similar. It is also common to have cases where both pathologies are present simultaneously, further compounding the situation. Osteitis pubis is the most common cause of groin pain in sports and is very common in kicking sports such as rugby and soccer players and to a lesser extent, distant runners. It accounts for 0.7 to 7% of all sports related injuries, and is relatively high for soccer players (5-7%). Although it has a low incidence rate in the general population, oftentimes it is misdiagnosed and athletes present debilitating symptoms, slow recovery, and high recurrence rates. A thorough physical examination and history are critical to making the correct diagnosis for osteitis pubis. Clinical diagnosis usually includes groin pain at the front and inner regions. The pain may radiate from the lower abdomen, down the groin, scrotum or perineum. This pain worsens during walking, pelvic movement, adductor stretching, abdominal muscle exercises and getting up from a seated position. In order to avoid pain, the patient may waddle when walking. Various physical tests can be performed, such as the lateral compression test, where pressure is applied to the pubic bone while the patient lies down, and the squeeze test, where the examiner places their two fists in between the patient’s legs while the patient is lying down, and the patient squeezes the fists together. Stage I – symptoms are present on one side of the body; pelvic pain; pain is alleviated during warm up, but worsens after a training session. Stage II – Symptoms are present on both sides of the body; pelvic pain; pain worsens after a training session. Stage III – Symptoms are present on both sides; Pelvic pain; pain present when kicking, sprinting, etc. ; patient cannot continue sport participation. Stage IV – Symptoms present on both sides; pelvic pain; pain while defecating, sneezing, and walking on uneven terrains; patient cannot perform activities of daily living. Due to the complexity of the groin anatomy, and the possibility of more than one injuries coexisting in the region, it is crucial that other possible causes of groin pain be considered. Groin (adductor) strains are particularly hard to differentiate from osteitis pubis, and both injuries may also coexist. Magnetic Resonance imaging, or MRI, is a powerful tool that can enable the clinician to visualize tears to the muscles or tendons that would be present in muscle strains. While symptoms of osteitis pubis typically resolve with time, this may take up to one year. Since it significantly impacts an athlete’s performance, it should be recognized and treated as soon as possible. Treatment is usually conservative, with rest, ice and activity modification to reduce aggravation being prescribed. Since it is an inflammatory disorder, non-steroidal anti-inflammatory drugs (NSAIDs) may be beneficial. Physical therapy, especially when focused on strengthening the pelvic muscles, has also been found to be beneficial to the recovery process and is the main approach used by athletes for quick recovery and return to sports activities. Corticosteroidal injections and local anaesthetics may also be utilized. 5-10% of patients do not respond to conservative treatment, and symptoms may persist for several months. For these patients, surgical intervention is warranted. Becker, I., Woodley, S. J., and Stringer, M. D. (2010) The adult human pubic symphysis: a systematic review, J Anat 217, 475-487. Morelli, V., and Smith, V. (2001) Groin injuries in athletes, Am Fam Physician 64, 1405-1414. Angoules, A. G. (2015) Osteitis pubis in elite athletes: Diagnostic and therapeutic approach, World J Orthop 6, 672-679.